Life has a fun photo mini-book of the Word's Must See Destinations, "Heaven on Earth." I really enjoyed browsing through it, picking both places I'd been and even better, places I planned on visiting this trip. 2) A shot of elephants wandering under Mt Kilimanjaro. You can tell its an old photo because the top of Kili still has plenty of ice cover, kind of sad really. 6) Geiranger Fjord in Norway. I've never been to scandanavia proper, and one of the big draws for me are the fjords of Norway. The idea of standing on a cliff and knowing I could jump off and free fall a few thousand feet gets a little tingle going. 7) Ayer's rock. 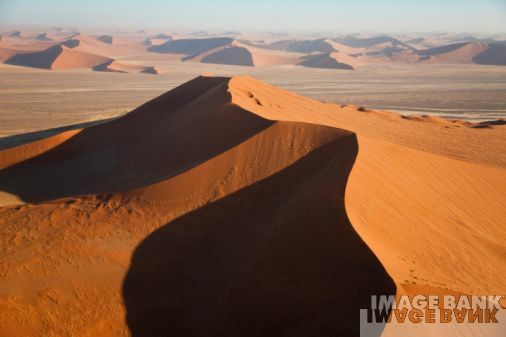 They have a unique aerial photo at sunrise that shows how the glowing orange enormous rock truly pops out of its otherwise flat surroundings. 8) The Abu Simbel temple carved out of a cliff, in upper Egypt. As the Nile flows by, its easy to imagine ancient Egyptians in the courtyard. 9) The blue hole in Belize. 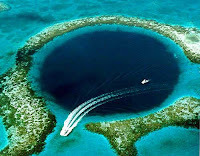 Its the standard postcard picture from the air, but the green coral surrounding the dark blue waters of the flooded cenote still brings back fresh memories of big schools of sharks, huge 20 foot stalagmites, and giddy nitrogen narcosis at 45 meters! 10) Petra. The shot they use shows a teasing part of Petra where some is still hidden behind the cliffs, with some camels in the foreground. Its reminiscent of the Indiana Jones movie where you see it slowly come into view as they round the final part of the canyon. 11) Guilin. Really amazing shot in the evening, with chinese boaters lighting lamps on the Li River, and the giant conical limestone karsts silhouetted in background. Can't wait! 12) Machu Picchu. They have a killer shot I've never seen before, the city on the mountain is under a blood red sunset reflected on the clouds above, which reflects on the city itself, making it glow orange. 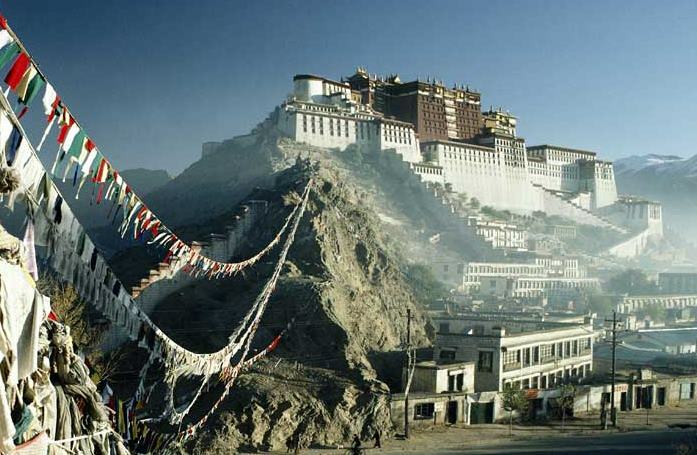 13) Potala Palace. I really like this shot. Unlike the standard postcard with the palace straight on, in this photo they take it below from an angle to show how it rises up above you. And there is a long string of fluttering Tibetan prayer flags linking the viewer all the way up to the palace. 14) Tikal's Jaguar Temple (Templo I). For some reason lots of shots of the Jaguar temple don't really show how steep and vertical it is and how the jungle surrounds you on all sides. This shot captures it all very well. 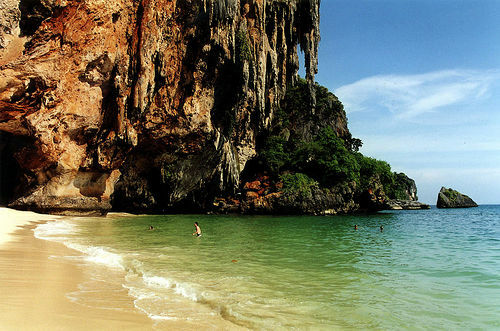 15) Pra Nang beach in Krabi, Thailand!! yeah! I was happy to see this place make the list. Its one of my favorite beaches in the whole world. Sparking cozy little white beaches surrounded by melting wax limestone cliffs, with the emerald green sea in the background. There is a rock you swim to in the middle of the picture that is perfect for jumping off. 16) Banff, Canadian rockies. This shot is so perfect. The truly stunning turqouise lake surrounded by white-capped mountains and pine forests. The only problem is the huge hotel ruining the view. Ah well, that is the the way of time. 17) Of course they save the best for last. 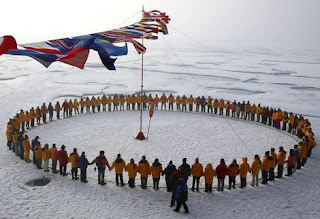 At the end of the book is a circle of people surrounding the "north pole" represented by a staff in the ice. A circle of flags of different countries is flown in a ring overhead. 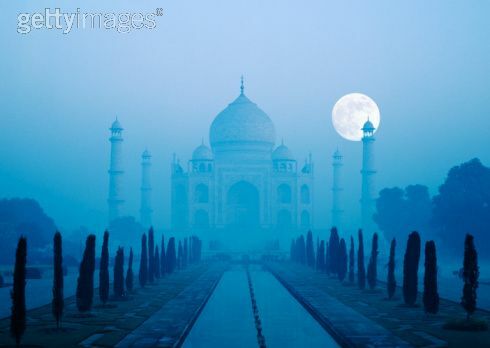 The symbolism is clear: all longitudes from all nations, east and west, come together at this nexus. That is what traveling the world is all about!!! Seeing everyone from different cultures and backgrounds joining together, and realizing we are one race, we are all just the same.